October is Adopt-a-Shelter-Dog Month, a great month to think about offering a home to one of the millions of dogs in need. Adding a dog to your household can bring great joy, but adopting a pet is a bit like looking for a roommate or significant other—the more you know beforehand, the greater the odds of a successful relationship. If you already have other pets, it can be even harder to find the right match. To ensure a successful adoption, think carefully about what it is you're looking for before you go to select a pet. Below are some questions to consider before you begin your search. Questions like these can help prevent problems down the line. Remember that personality is the most important factor in a good match, so let the answers to these questions, rather than a dog's "look," guide you. 1. Are you capable of caring for a new dog financially? Licensing fees, food, heartworm prevention medicine, vaccinations, leashes, and regular veterinary care are just a few of the costs associated with having a dog. Among other unexpected occurrences, dogs may get injured or otherwise require extraordinary veterinary care, and they can also cause damage to clothing and property. 2. Is your household sedentary, active, or somewhere in between? Do you want to settle down on the couch at the end of the day with a dog in your lap, or do you go on runs, hikes, and camping trips regularly? If you like the idea of a dog in your lap, consider adopting a senior dog. Many senior dogs are already well trained and they generally require less exercise than their younger counterparts. Even if you are active, ask yourself if your activities are dog-friendly (e.g., hiking, running) or not (e.g., rock climbing). If your dog can't join in your activities, you may wind up spending less time with your dog than a more sedentary person would. 3. How much time will you have for your new dog? Do you have a job that requires you to be out many hours each day? Are you a homemaker with a house full of young children? What are the schedules of the other members of your household? If everyone in the household is out all day, and no one will exercise or train the dog regularly, select a relatively sedentary dog. Be sure to set up either regular daycare or walks for your dog; otherwise he will lead a rather lonely life. On the other hand, if you or another member of your household is a clicker training junkie, or works from home and likes to walk outside while taking breaks, an active dog that will enjoy lots of training and walks might be a better choice. Bear in mind that both puppies and dogs from more "active" breeds tend to require more training and exercise. If you have little free time, consider choosing an adult or senior dog from a relatively calm breed, or a dog that has already learned basic cues and manners. 4. How tolerant are you of slobber and fur? Some dog breeds tend to slobber more than others, while others shed a great deal. If you don't mind grooming your pet every day, you can reduce the shedding significantly, but grooming time cuts into exercise and training time, so be sure to plan accordingly. 5. Are there other animals in your household already? If so, are they likely to welcome a new dog? Do you have other pets in your household? They may not be particularly thrilled about the addition of a new dog. If any of your pets are likely to be viewed as prey by dogs (birds, rodents, cats), make sure the dog you choose can understand that these pets are not prey. It's also critical to set things up so that your other pets are not only physically safe, but also feel safe. A bird in a cage may not be at risk of being eaten by your new dog, but being stalked all day will likely cause the bird stress. Getting everyone in the household to create and sign a contract outlining responsibilities and expectations can be very helpful. 6. Does everyone in your household want a new dog? If only one person wants a dog, that person will not only have to do all the work, but will also have to defend the dog if the dog annoys another member of the household. It's also harder to train a dog when the household isn't united. Getting everyone in the household to create and sign a contract outlining responsibilities and expectations can be very helpful. 7. Is anyone in your household allergic to dogs? If anyone in your household is allergic to dogs, getting that person's permission to have a dog is even more important. That person will be more affected by the presence of the dog than the rest of the family, no matter how well behaved the dog is. 8. Are you allowed to have a dog where you live? If your building does not allow pets, or your community sets a limit to how many or what types of pets you can have, getting a new dog could result in a fine, or even an eviction. 9. Are your expectations reasonable? Do you picture nights by the fire with a perfectly behaved dog at your feet? A dog that stays in the yard for 12 hours a day unattended, without barking or bothering the neighbors? A dog that trots at your side as you run along the beach? Life is not like a big-budget motion picture. Dogs require time and attention, and no matter how much training you do with your new dog, there will be occasions when your dog does something wrong. Dogs left alone in the yard tend to bark and dig up flowerbeds. Dogs chased by unattended toddlers may growl or snap. Dogs eat things left on the floor, and may stop to sniff just when you are hitting your stride on a run. Set reasonable expectations for your new dog. 10. Are you prepared for a worst-case scenario? What will you do if the dog you adopt turns out to have a terrible habit or two? What if he or she gets very ill? Many dogs wind up in shelters because someone wasn't prepared to stick by them when the going got tough. 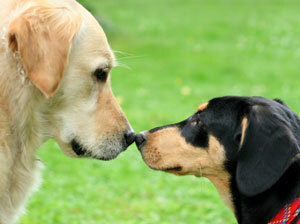 Dogs are living beings, and bringing one into your home is not a decision to be made lightly. Many people think dogs in a shelter must have major issues, but that is far from true. People sometimes surrender dogs for ridiculous reasons (one dog I know was surrendered because he no longer matched the owner's décor). In other cases, it wasn't a good match to begin with—an active dog in a sedentary household, for example. What's more, in today's rough economy, people are dropping pets at shelters because they don't have the means to care for them. It's also a good idea to consult an expert, such as a dog trainer or certified behaviorist, to help you evaluate any breeds or specific dogs you are considering. If you decide to adopt from a shelter, you will likely have to assess the dog's suitability for yourself. Make sure you have answered all of the questions above and know what type of dog will fit into your household best. It's also a good idea to consult an expert, such as a dog trainer or certified behaviorist, to help you evaluate any breeds or specific dogs you are considering. How animals behave under the stress of the shelter environment is not always a good indicator of how they will behave in your home, so take what you observe with a grain of salt. Ask the staff and volunteers for information, and pay special attention to comments (written or spoken) that imply a dog is not right for you. At some shelters, staff and volunteers must adopt to anyone who can afford the fee, so they may not be allowed to tell you that they think a dog is a bad fit for you. You can usually visit with shelter dogs outside their cages, and some shelters will even let you take a dog on a walk under supervision. Use these opportunities to observe the dog's behavior in a different context, while asking any questions you have about the adoption process. If you are not sure about a certain dog, or have other pets and need to introduce the dog to your other pets, you may be able to put a hold on the dog while you think things over or arrange an introduction. Another way to improve your odds of getting a suitable dog for your household is to adopt from a reputable rescue organization. Some rescue organizations focus on a certain geographical area, while others focus on certain breeds or types of dogs. Whatever you are looking for, there is likely a rescue organization that can help. Search online for rescues (search for "rescue dog" and your area or the desired breed), or check out Petfinder, a website that lists dogs available for adoption from both shelters and rescues nationwide. Many rescues put dogs in foster homes, or house them in facilities where they interact with handlers regularly. The foster family or handlers may be able to tell you if the dog is housetrained, gets along with other dogs, likes children, or plays well with cats. Nothing is guaranteed (a dog that behaves perfectly around dog-savvy cats in a foster home may still be inclined to chase a cat that runs away, for example), but the information they provide can help you figure out if a particular dog is a good fit for your household. You can even consider fostering a dog yourself to learn more about him or her and to see how well the dog, or any dog, would fit into your household. Most rescues have a rather rigorous application process, and their requirements can seem intrusive at times, but they are designed to ensure the best possible matches. Many rescue contracts include a clause that requires you to return the dog to the rescue if things don't work out. The information you provide to the rescue in that situation helps the rescue place the dog into a more appropriate home the next time, so if you do have to return a dog, for the dog’s sake be forthright about your reasons. Whether you go to a shelter or a rescue, don't write off every dog with issues automatically. No dog is perfect, and a good trainer can help you work through most issues. If you adopt a dog with major issues, though, do it with your eyes open, and know that the road ahead may be difficult at times. The investment you make in selecting a pet carefully and introducing him or her to your home properly will pay dividends for years to come. Some shelters and rescues will allow you to introduce your current pets to a dog you are considering either at their facility, at your home, or, ideally, in a neutral location. Introducing your current pets to a dog you are considering can help you figure out if the dog is a good fit for your household. When possible, it's best to introduce the new dog to current pets on neutral territory in a gradual manner. Look for a follow-up article next month that will cover this topic in greater depth. No matter where you get your dog, or how many pets you already have, treat your new dog like a young puppy at first. Limit unsupervised access to the house, keep valuable items out of reach, and take the dog out for lots of potty breaks. He or she may turn out to be perfectly housetrained and well-behaved, but it is always better to be safe than sorry. If you take the time to prepare, you have much better odds of a successful match. The investment you make in selecting a pet carefully and introducing him or her to your home properly will pay dividends for years to come. Thinking About Adopting a Rabbit this Easter? Consider This!